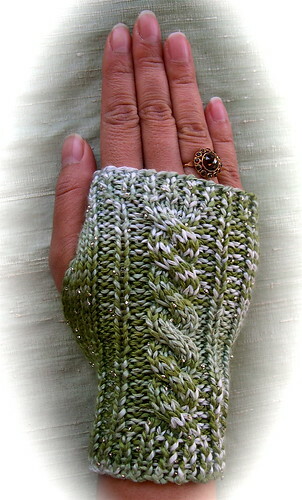 WIN THESE LUXURIOUS FINGERLESS GLOVES!!! FOR FREE PATTERN + PICTURE TUTORIAL PLEASE CLICK HERE. Feeling lucky? You can win one of these fabulous luxurious beaded silk fingerless gloves!!!! It all started with these Two Sleeping Beauties, remember? What do I have to do to enter into this competition? Just say anything really, as long as you mention Denaedin and Emanelle. When leaving a comment, there’s this box where you have to state your e-mail so that I can get a hold of you when you do win. Your e-mail can only be viewed by me and I will treat it with confidentiality of course. You have a week to comment. Closing date is Wednesday May 16 and the winner will be announced Thursday May 17. There will be two winners; one will win Denaedin, the other will win Emanelle. Hey, will you post the patterns? YES, FOR FREE! Both patterns will be issued when the winners are announced on Thursday May 17! Disclaimer: by no means I want to give the impression that I am the first person in the world who invented how to knit fingerless gloves and/or cables! As a novice knitter I am just very excited to have figured out by myself how to knit these gloves… and I just wanted to share! That’s all… Hope you enjoy, just like I am enjoying my journey as a Novice Knitter. This entry was posted on Wednesday, May 9th, 2007 at 10:46 pm and is filed under fingerless gloves, Finished Object, Free Pattern, Knitted cables, Knitting, Yarn. You can follow any responses to this entry through the RSS 2.0 feed. Both comments and pings are currently closed. 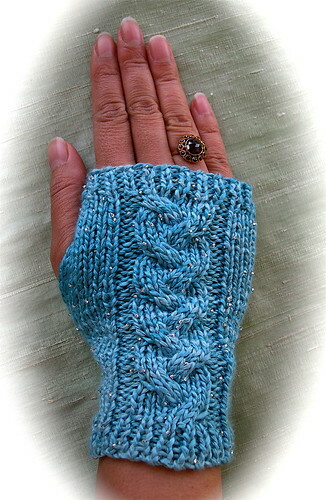 56 Responses to WIN THESE LUXURIOUS FINGERLESS GLOVES!!! i can’t believe you knit these things! they’re amazing. its hard to tell which pattern i like more because the yarns are different. However, I think I might like the Emanelle because of the bold features ( and maybe because the yard is blue! ), but then again, maybe I like the Danaedin for the delicate features! Maybe some day soon I’ll finish my scarf!!! Denaedin and Emanelle are really lovely! 😀 I particularly like Denaedin – looks like a garden! wat mooi Nancy, zowel Danaedin als Emanelle zijn hardstikke prachtig! Desondanks kies ik toch voor Emanelle, meer voor de kleur! En wat een mooie ring! You’re not keeping either Denaedin or Emanelle? I guess you’re a process knitter, but really…that gorgeous painted, beaded silk…REALLY?! Work five rounds in knit 1, purl 1 pattern. Knit in round, with desired cable design on center middle needle, for 50 rounds. On needle one, use a common 7 stitch button hole. Continue knitting in round for another 20 rounds. End with 5 rounds of knit 1, purl 1. Honestly, people have been using this basic pattern for decades. My mother wore a longer version of this pattern, with a more intricate Celtic knot design, back in the 70’s. Please, don’t go passing off traditional patterns you ‘discovered’ as your own. That’s almost as absurd as me folding a box out of paper and claiming that I invented it. 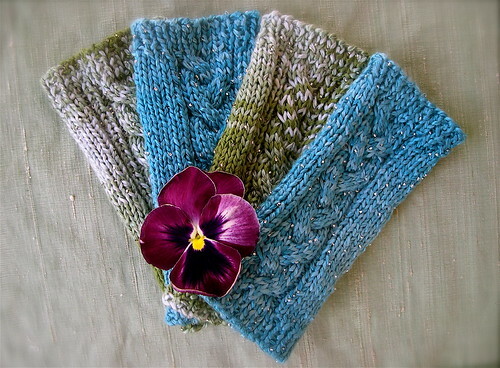 I love the yarn, and I adore both Denaedin and Emanelle…can’t wait for your patterns. Lovely work. Love Emanelle. I can’t believe you aren’t keeping them. They are gorgeous!!!! They look really great. We must have started knitting around the same time I taught myself I year ago Feb. I have to tell you my daughter has been bugging me for a pair of gloves. I made one pair and they turned out awful. I have tried and tried and tried. I finally gave up and went back to socks. I will try again maybe when you post the patterns I will give it another shot. The Denaedin is great love the look of the cable it looks delicate and classic. The Emanelle I love the blue color. That is the one my daughter would probably love. You did a great job on both of them congratulations on them. Oh, the Emanelle ones are beautiful!!! My hands would love to touch that yarny goodness! They are both lovely but I’m a sucker for anything green. I’ve never knit with a beaded yarn, I think I’d better try that. They’re both beautiful, Nancy! Gorgeous yarn and amazing job. I really need to start knitting more….I would love to win Denaedin! I can’t believe you’re giving them away! Both Denaedin and Emanelle are DAZZLING!! I’m a green girl, I love both Denaedin and Emanell, but my favorite is Danaedin, simply beautiful! And Rotkappchen, if you can’t say something nice don’t say anything at all! Denaedin and Emanuell are beautiful ambitions of taking a subject, dissecting it to fully understand HOW things are created, then giving it your own style. It’s not just copying a set pattern. It’s amazing to me how such a “young” knitter can delve into a new experience with such a beauty of heart. This even shows in your blog. ~ And, I agree with what Colette said about Rotkappchen’s comment; how rude . . . didn’t she read Nancy’s Disclaimer? Come-on, we’re supposed to be kind, passionate knitters! Thank you all for stopping by my blog, I really appreciate it! We all have our opinions and feelings about certain things… Rottkapchen has a valid point. No I am not original, and no I am not the first person in the world who invented how to knit up fingerless gloves and cables. It was not my intention to give that impression. Happy knitting everybody and thank you so much again for stopping by!!! Denaedin and Emanell were lost and cold and alone in the forest. They collapsed tearfully into a bed of pansies. Now this particular bed of pansies belonged to the good sorceress, Purly, whose heart was touched as she looked tenderly down at the poor, lost girls, clinging together in their fear and exhaustion. She withdrew to her tower and began drawing threads of power to herself, and, while spells of safety, comfort and finding dropped from her lips, glittering, bound the threads into mitts that would lead the girls hands towards home. In the dew of the morning, the girls awoke to find their hands warmly adorned with sparkling mitts. They began, again, to wander, but as they went, they felt, as it were, a gentle tug, as if an invisible guide were holding their hands and pulling them. They followed their hands, and were soon re-united with their families. Oh, and a design is a design. You chose the materials, the size, the length, the placement of the cables, width of the cables, to rib or not – all design decisions – all making your version of fingerless gloves their own unique personality. Look in any pattern book and you will see patterns for fairly basic items that many knitters could figure out for themselves. However, as a designer and knitting instructor myself, I can tell you that the vast majority of knitters will not even knit a dishcloth without precise directions, and that there are many for whom a pattern like yours would be a valuable addition to their pattern library. Don’t listen to the unfair criticism. You have designed – yes, designed! – these beautiful mitts and you deserve the credit for that. How lovely! If I were selected to receive them, I would show them to a group of preteen beginners in our summer school program for inspiration and motivation. Also to demonstrate that one can work with any amount of yarn to come up with something beautiful. The students could try them on and feel the softness and warmth of the yarn. Then I would wear them all winter! Incredibly beautiful gloves and site! Can’t wait to see more, and it makes me so want to learn to knit! Those are lovely! I am in love with the colors on Denaedin, and Emanelle is beautiful too. It gets chilly at work, even when it is 100+ degrees outside, and those would be great to have. Some people just have to criticize everything. I think it makes them feel like they are better people because they know so darned much about everything. But, obviously, they really don’t know so much or they’d know what Thumper said: if you can’t say nothin’ nice, don’t say nothin’ at all. I’m so pleased for you, to have fallen so in love with knitting and with beautiful yarn and with sparkle and making your own way into your own pattern. I would be “over the moon” as they say in Australia, to have Emanelle in my pocket whenever I needed to warm my hands, or just flash a little beauty at the world. Thanks for sharing your enthusiasm and joy to the knitting world. I think that both of them are gorgeous – you did a lovely job with them, but would be partial to Denaedin because of the green – that’s my favorite color – and I think I prefer the somewhat thinner cabling on that. All in all they’re both just gorgeous though – congrats! Rotkappchen, even before you made her feel like she needed to somehow ‘qualify’ things, she never gave any impression she’d somehow INVENTED fingerless gloves. For goodness sake, it was a post because a knitter was excited about her project, modifications and creations on a pattern, and some gorgeous yarn. Spare us the holier than thou attitude and snide comments, eh? Oh, what an inspiration you are. I started knitting in September, and I would love to be able to knit something as beautiful as Denaedin and Emanelle. If I were to win a pair of those beauties, I would be so honored to give them a new home. Wow, what lovely gloves! What a great choice of yarn and I agree, gloves are the perfect way to show off these beautiful colors and that special yarn. With both so inspiring, what to choose….ok, Denaedin it is. That green is so pretty. But if I’ll be the unlucky one to not win them, I’m looking forward to see your pattern. Thank you for sharing! I’ve been a knitter for a couple of years and never ever did I bump into somebody in the knitting community treating other knitters arrogantly over one’s work, design or choice of yarn. Shame on you, Rotkappchen. Ooh, it would be so hard to choose if I won! I was drawn to Denaedin at first though; I do love the combination of green with pale pink. You are so generous to offer these – and the pattern, too! I rarely follow a pattern from start to finish, as I prefer to use the pattern as an inspiration for a starting point. Your creations are truly inspiring, and even if I don’t win a pair of gloves from you, I have still won by being able to view them and see what is possible! Thank you for taking the time to blog and share your talent. Wow! You are very generous, these are gorgeous! yay!! i was fortunate enough to see denaedin and emanelle in person and they really are beautiful, so much love has gone into them!!!! by the way i think i Need to win them. Great Job! I really love the plaited cable in Emanelle :). Looking forward to having a sample of your beautiful work in The Naked Sheep! It was nice having coffee with you this morning. Gorgeous work! They are both lovely. Thank you for sharing your knitting adventures. Saw your pos on KR. I too posted a free pattern on my fairly new blog(without a contest) in hopes of geting people to visit and comment…you know maybe amke a few blog friends. well, I can see hat the conest is the way to go as i only received about 3 comments! Regardless, your work is beautiful and I commend you for being a creative knitting soul! I like both gloves, bu am so partial to blue, so if I won I would love Emanelle! You already know how much I love Denaedin and Emanelle! I can’t believe there’s already drama on your blog! I guess you’ve arrived! I’m so impressed, especially with the Emanelle pair, the color is so much like the shade of my children’s eyes. I make far less glamoress fingerless wonders, but am eager to figure out how to cable. There is no little box for my email, but considering what else finds its way to my email (mortgage rates that are upsurd and sexual aids that don’t even pertain to my gender) I’ll chance it here. Hi ! I’ve just found your blog by chance .It’s great ! And I love Denaedin and Emanelle ! What a lovely yarn ! Hartstikke mooi, meid! Ik vind Denaedin het mooiste, qua kleur, maar ook vanwege de smallere kabel. Wat een reakties heb je al gekregen, zeg! Dat gaat helemaal goed komen! Tot gauw. I love the Emanelle! Like the braided look in the cables. Gorgeous yarns too! What a beautiful way to share your knitting! Denaedin and Emanelle are both obviously labors of love. Being a new knitter these are on my dream list of things I would like to become talented enough to knit. Thank you for sharing your lovely work! Hello, let me just start out by saying OH MY GOD these are GORGEOUS. I almost fainted when i seen them. I really like Denaedin a lot Emanelle captured my heart! Congatulations on such beautiful creations! I am a very new knitter, and the hobby is amazing and so it the beautiful yarns. Your two gloves are an inspiration to me, I have only knitted bags and a sweater in the three months that I have learned, and to think that my future may hold the chance for me to learn to knit like this. Your talent shines through for me with the Denaedin, I love the color and the way that yarn has a shading that is elegant. WOW! I got to see these elegant and inspirational little darlings in person. They are simply beautiful and I was especially attracted to the Danaedin pair. What I would be most proud of if I won these would be that I actually saw a little of the process of their creation and the appreciation I have for handmade goods, and even better, locally made–they’re almost too good to be true! Nancy – You are an inspiration! I am glad to see how excited you have been to discover creation, knitting, sharing. Pay no mind to that other voice. We all find inspiration in others creation and put our own twist to it! I would love a pair of those beauties!!!! Emanelle or Danaedin. I could display them in the shop!!!!! Danaedin and Emanelle…I don’t know if I am more smitten by these ‘artfully’ wonderful yarns, your lovely development of the stitches or the photography and fun of your blog. Als ik zou moeten kiezen tussen Denaedin en Emanell zou ik het niet weten, ze zijn allebei even mooi ! Both Denaedin and Emanelle are beautiful, and I’d love to win either pair. I could certainly use them around here in the winter. 🙂 Thanks for sending me over! Denaedin and Emanelle are both gorgeous! Your fingerless gloves are to my hands like chocolate is to my soul-scrumptous! WINNERS WILL BE ANNOUNCED ON THURSDAY, MAY 17! THANK YOU ALL SO MUCH FOR ENTERING INTO THIS COMPETITION!!!! I know the contest is closed, but I just want to say that they are beautiful. Very good work. Wat een mooie hand heb je en die ring, die is echt een beauty. Iris Schreier voor de patronen. Nou, ga zo door. Ik bekijk je blog altijd wel.